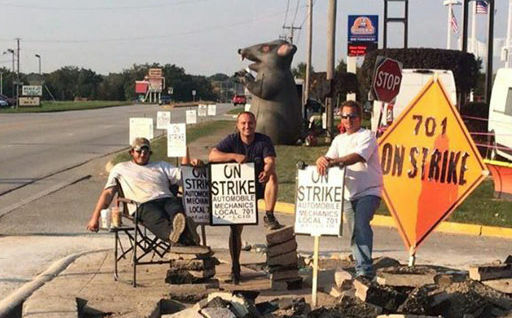 EAST DUNDEE, Ill. – Auto mechanics of Automobile Mechanics Local 701 (IAM) have been on strike at Al Piemonte Chevrolet for a fair contract for over three months. I had a chance to speak with the striker’s Union Business Agent, Bill LePinske. Bill had just returned from court the previous day, and related the events leading up to filing for action against the dealership, particularly being assaulted with a small bulldozer while East Dundee Police watched without interfering. Bill explained that while he was properly in fear of losing his feet or legs, he was far more afraid of letting down the nine members of the Strike Team, who at the time had been standing for over 10 weeks. 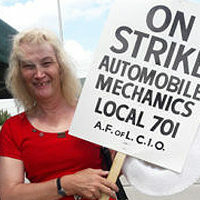 Local 701 has been representing Chicago area auto mechanics since 1931. It is one of the largest mechanics’ locals in the United States representing auto and truck mechanics, heavy equipment, excavating and paving, road building, forklifts, high-rise equipment, tank washers, fuelers, trailer body and marine industries.